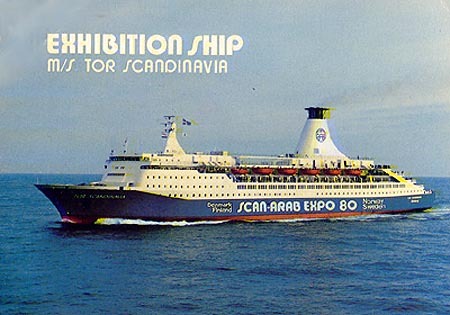 This page is devoted to postcards and photographs of the Tor Lines ferry Tor Scandinavia. 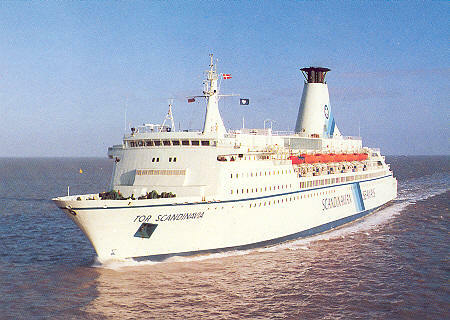 Tor Scandinavia was built in 1976 for the Goteborg-Amsterdam and Goteborg-Felixstowe services of Tor Line, one year after her sister Tor Britannia. 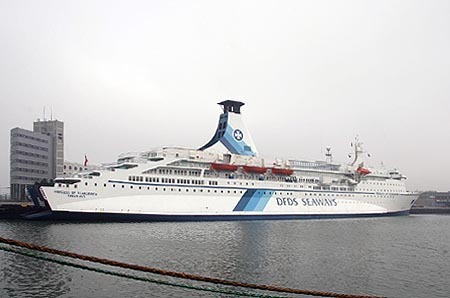 They were both 16000grt, carried 1358 passengers, and had a high service speed of around 25knots (over 26knots maximum). 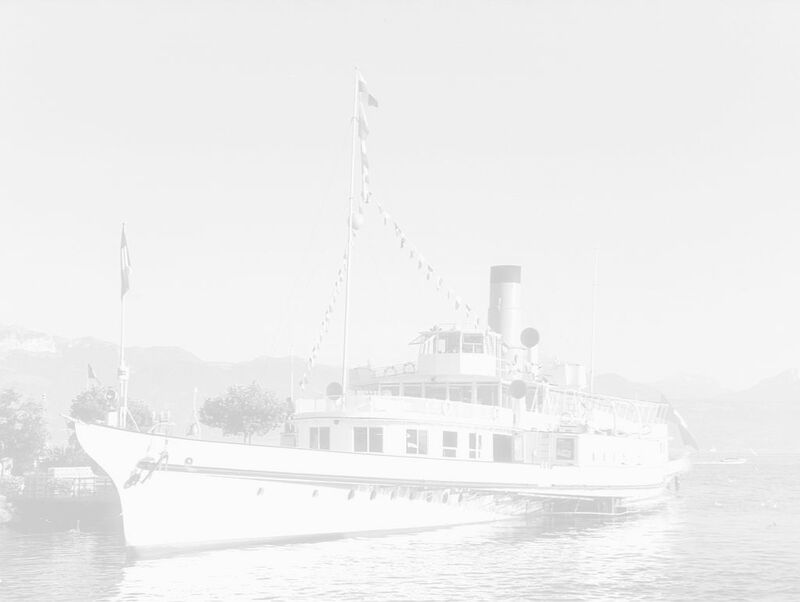 In 1980, there was a brief partnership between Tor Line and Sessan Line, marketed as SESSAN TOR LINE. 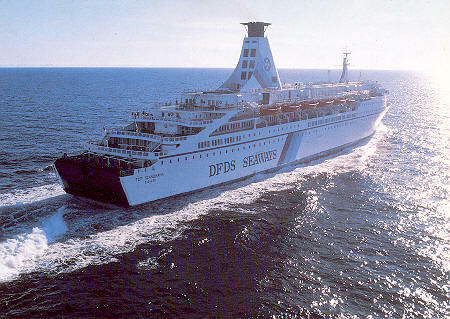 In 1981 the passenger operations of Tor Line were acquired by DFDS Seaways. 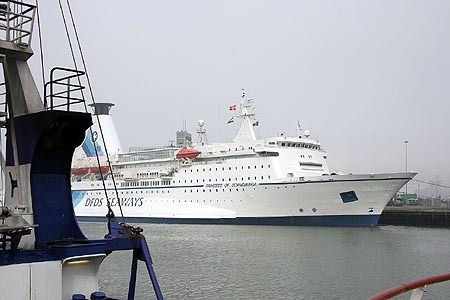 The two ex-Tor ships were initially marketed as DFDS TOR LINE. 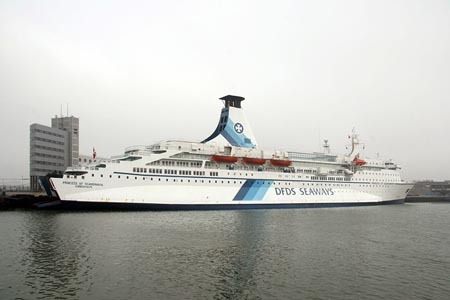 The logo was soon removed, and Tor Scandinavia began to serve on other DFDS Seaways routes. 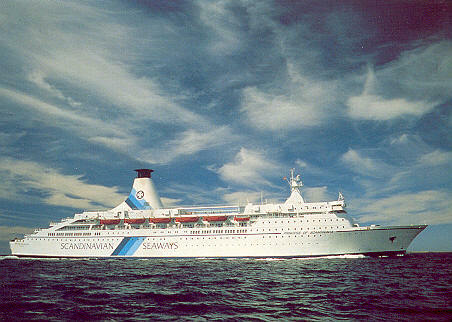 Tor Scandinavia was renamed Princess of Scandinavia in 1991. 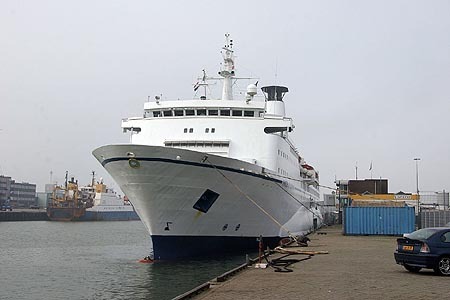 Although her sister Prince of Scandinavia was sold in 2003, DFDS announced late 2004 that Princess of Scandinavia would be fitted with new sprinkler systems, catalytic converters and upgraded cabins and bar area, ensuring suitability for continued service. 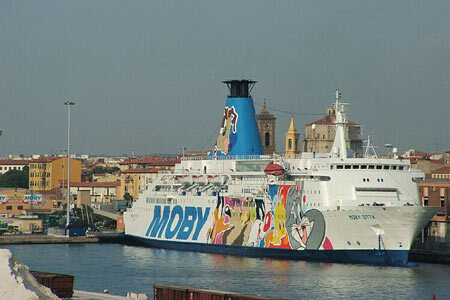 Princess of Scandinavia was sold to Moby in 2006 and renamed Moby Otta. Tor Line official postcard of Tor Scandinavia (plus Tor Britannia). 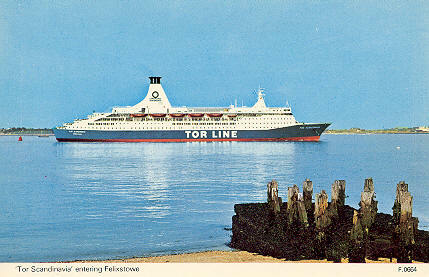 Dennis postcard F.0664 of Tor Scandinavia arriving at Felixstowe. Sessan Tor Line official postcard of Tor Scandinavia in SESSAN TOR LINE colours. 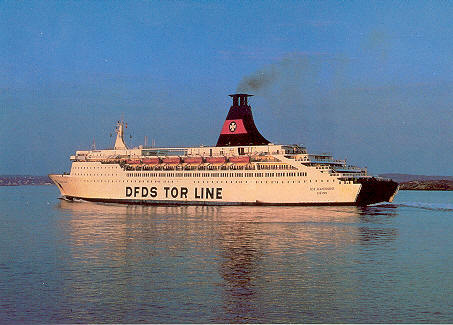 DFDS Seaways acquired the passenger services of Tor Line in 1981. 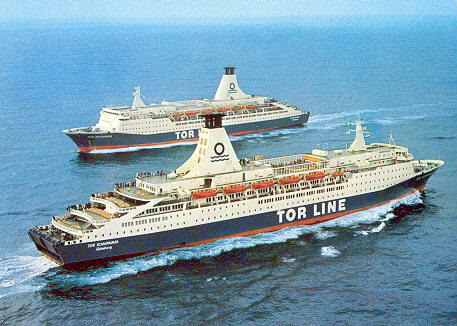 Initially, the ex-Tor ships carried the logo DFDS TOR LINE on their hulls, as shown in the card below. 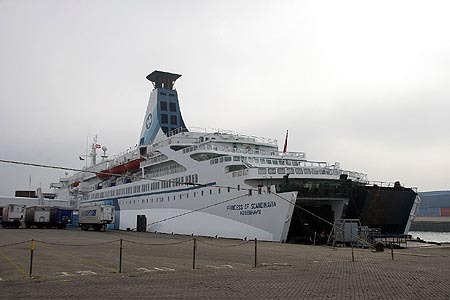 The ships were re-registered in Denmark, and soon began operating on services other than the Tor Line Felixstowe-Goteborg and Amsterdam-Goteborg routes. DFDS Seaways official postcard of Tor Scandinavia in DFDS TOR LINE colours. was temporarily given the name World Wide Expo. 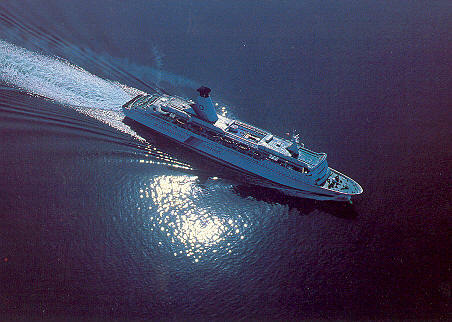 This postcard was issued by the charterers. 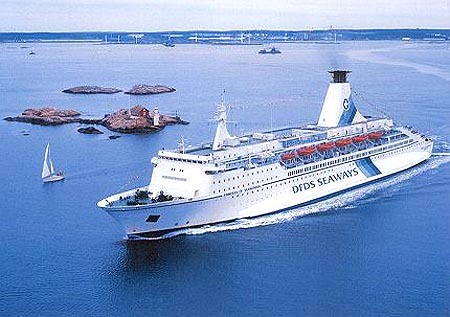 DFDS Seaways official postcard of Tor Scandinavia in DFDS Seaways colours. 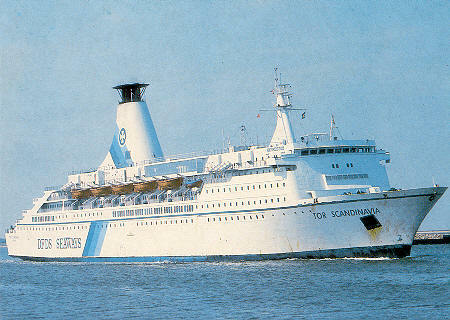 Trojaborgs postcard ES8 of Tor Scandinavia in DFDS Seaways colours. 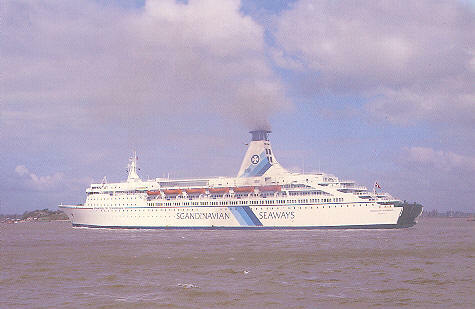 Scandinavian Seaways official postcard of Tor Scandinavia in Scandinavian Seaways colours. 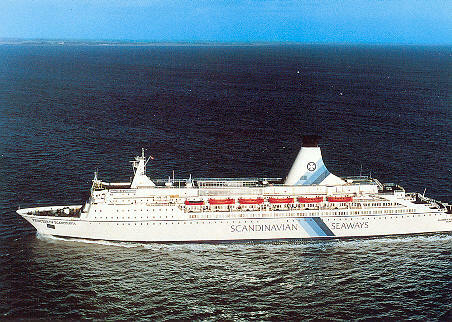 Tor Scandinavia was renamed Princess of Scandinavia in 1991. 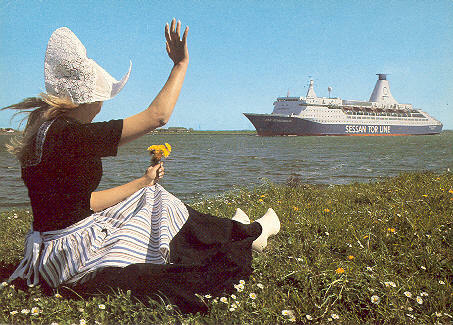 Scandinavian Seaways official postcard of Princess of Scandinavia. 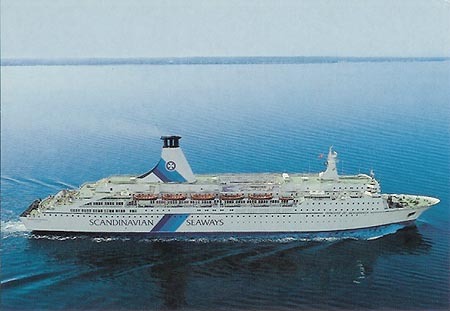 Ramsey Postcards serial number 44 of Princess of Scandinavia in Scandinavian Seaways colours. 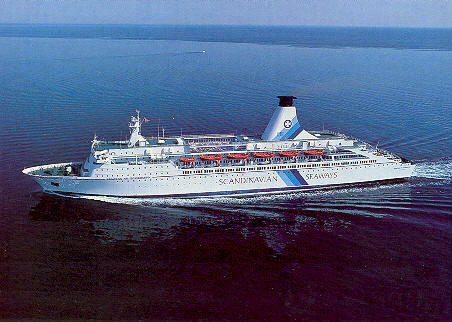 This is a DFDS Seaways official postcard, issued after the title was revived in 2000. Note the flared hull to conform with latest stability requirements. 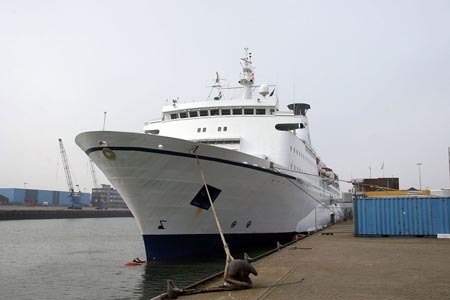 Princess of Scandinavia at Ijmuiden. Photo: &COPY; Cees De Bijl, 19th February 2006. Photo: &COPY; Cees De Bijl, Ijmuiden, 19th February 2006. Moby Otta was built in 1976 as Tor Scandinavia for the Goteborg-Amsterdam and Goteborg-Felixstowe services of Tor Line, one year after her sister Tor Britannia. 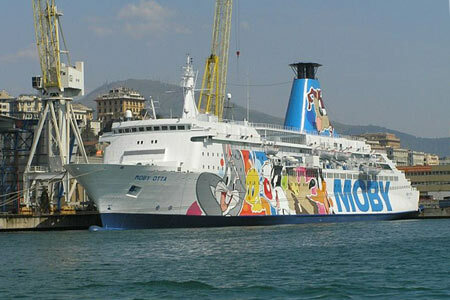 They were both 16000grt, carried 1358 passengers, and had a high service speed of around 25knots (over 26knots maximum). 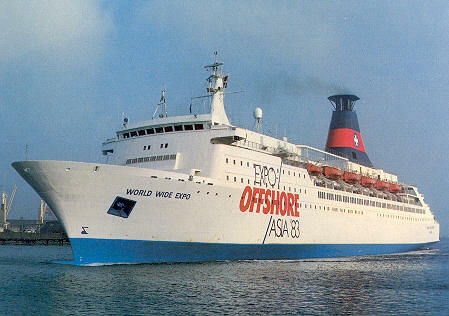 In 1980, there was a brief partnership between Tor Line and Sessan Line, marketed as SESSAN TOR LINE.